Kierland Golf Club is located on the four star golf resort named the Westin Kierland Golf Resort and Spa. Situated in the heart of Scottsdale, Arizona, this Scott Miller design offers (3) 9-hole experiences; Acacia, Ironwood and Mesquite. Each 9-hole course is combined to offer (3) 18 holes combinations. The golf course names derived from native plant life found on the course. 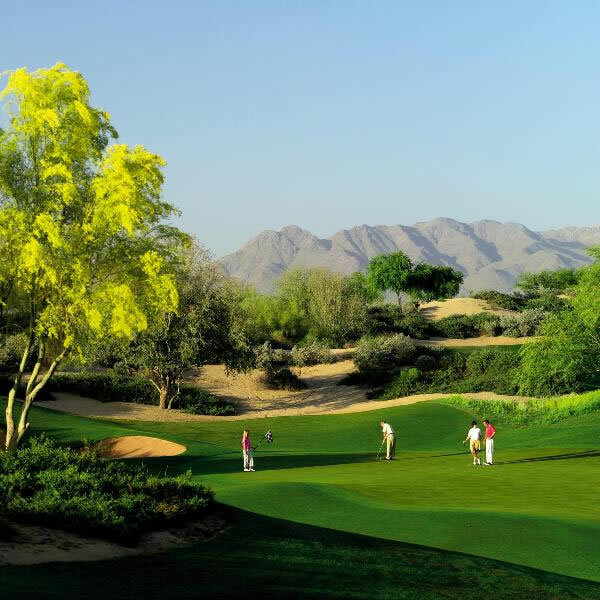 Enjoy the challenge of over 300 bunkers, calm lakes, rough desert washes and many desert trees. Elevation changes of up to 80 feet offer views of Camelback, Mummy, McDowell and Pinnacle Peak Mountains. All three courses compare in level of difficulty. Fairways are generous and at times parallel. The greens are of good size and rich with undulation. Considered a traditional course due to the wide, forgiving fairways, this Scottsdale golf course is a great choice for any level of golfer. From Phoenix Sky Harbor Airport: Follow the airport signs to the I-10 W. Merge onto I-10 W. and continue 1 mile. Merge onto AZ-51 N. via exit #147. Continue 12.8 miles and exit Greenway Rd. via exit # 12. Turn right onto Greenway Rd. and continue 3.5 miles. Turn left on Clubgate Dr. and follow signs to course.